Our pick of the most eye-catching classic and modern poster designs. Poster design is a seductive field, giving designers and artists a blank canvas to provoke and inspire. Posters sometimes go wrong but when they go right, poster art can be truly powerful. Using posters for advertising and promotional purposes began back in the 1870s. Initially they were black and white and heavily text-based, but the introduction of Jules Cheret's three stone lithographic printing process meant artists could soon develop striking, colourful poster designs. For more stunning advertisements, see our roundup of the billboard advertising so good it may stop traffic. Get up to 40% off Adobe Creative Cloud right now! In this post we've gathered together a selection of our favourite poster designs. This page celebrates modern poster designs from both commercial projects and indie ventures, or click through to page two to see a range of classic poster designs that have stood the test of time. Click the icon in the top right of each image to see the full-size poster. Creative agency Mother Design was challenged with creating the visual materials for the annual gathering of America’s leading design association, AIGA, at a point in time when the organisation has undertaken a new vision to become a hub for broader creative constituencies. A vibrant poster series was a particular highlight. “Our design solution became a metaphor for the organisation and annual conference itself: evolving over time and embracing the beautiful, messy and sometimes unexpected ways that people and ideas come together in one place,” explains creative director Jason Miller. 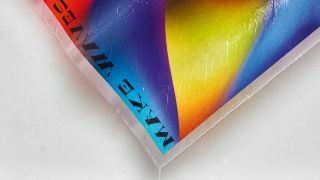 Make Waves is a series of three-dimensional posters on silk paper with fibreglass coating (shown close up in the article's hero image), created by communication agency This is Pacifica for the international Surf City Festival held in Barcelona. The process of creating the posters was similar to that of building a surfboard. “To shape the posters, a professional surfboard shaper was invited to create a series of structured casts that allowed him to shape each poster with different waveforms and volumes, transforming a graphic piece that is usually flat into a poster with three-dimensional waves,” explains This is Pacifica creative director Pedro Serrão. Swiss designer Annik Troxler created the visual identity for the 2018 Jazz Festival Willisau, and her poster designs combine playfulness with a strict coherence and attention to functionality. In developing her design vocabulary for this project, Troxler has referred to the systems of rhythms and forms in music, creating shapes and typographic elements with her unique interpretation. Troxler’s intention was to make movement ‘visible’ by using a simple device: circle elements rotating with and against each other on different layers of the surface. The festival’s design identity began with an accident. “As I zoomed in on an area a ‘pixel pattern’ appeared. I immediately knew that I wanted to make something out of it using varying densities, brightnesses and typography,“ explains Troxler. The 2018 radical rebrand of Shakespeare's Globe resulted in some truly striking poster design. The entire poster series is deceptively complex in its bold simplicity. The 20 sided symbol, used on each of the posters in a different way, represents the shape of the Globe itself, and was physically made from a rubbing of the original wood. There are reasons for the choice of colour scheme and typeface too. To find out more about the inspiration for the brand strategy see our piece on How Superunion modernised Shakespeare's Globe. We've chosen the Hamlet poster to feature on this list, because of how it cleverly brings the classic symbol of the skull bang up to date, using the Globe's new logo to create an tribal theme that reflects the diversity of the director's interpretation. The design team Helmo – Thomas Couderc and Clément Vauchez – created this dramatic series of posters for a fashion event at the Galeries Lafayette in Paris. The concept is centred on the idea of animal instinct versus fashion instinct. The posters were displayed on a huge scale, over the windows and dome of the store. Music venues don’t get much more indie or experimental than Knochenbox in Berlin – it occupies a crypt under a chapel. It’s fitting,then, that this gig poster also steps away from the norm. The limited-edition screenprint poster is the work of Palefroi, Berlin-based French design duo Damien Tran and Marion Jdanoff. Noise x GIF Fest is Singapore’s biggest GIF festival. When it came to crafting the event’s loud identity, local studio BÜRO UFHO realised the design would need to work as both a static piece of print as well as an animation. “It was pretty much set from the start that the poster would have to be an animated GIF,” laughs BÜRO UFHO creative director Jun T.
This teaser poster is one in a series of four designed to tantalise fans looking forward to the upcoming Star Wars movie all about Hans Solo. Masking visuals inside the typographic titles is an effective treatment, with each poster showing a different character. However, like much to do with the production of this film, the teaser poster release didn't run smoothly. It wasn't long before someone spotted an uncanny resemblance to a range of Sony Music France album covers released in 2015, and a plagiarism scandal swiftly followed. Released earlier in 2018, Steven Spielberg's Ready Player One looks is a retro sci-fi extravaganza. The movie poster fittingly mirrors this aesthetic, with a vintage style that draws on the works of legendary poster illustrator Drew Struzan – of Indiana Jones, Back to the Future and Star Wars fame. It's one of the classic poster design aesthetics currently enjoying a resurgence in popularity. The official Thor: Ragnarok poster design was warmly received by designers and fans alike, thanks to its refreshing and sophisticated visuals, and some cool typography that harks back to 1980s gaming (for more on this, take a look at our article on typographic trends in Marvel logos). A psychedelic masterpiece, the poster harmoniously positions key characters to build a sense of excitement around the film. This poster design is a masterclass in how to use the Photoshopped approach without descending into messy chaos. Illustrator Olly Moss is well known for his clever, minimalistic poster designs. As well as this officially licensed screenprinted poster for a 2010 screening of The Evil Dead, he’s also created posters for the Harry Potter posters, The Jungle Book, Star Wars Trilogy and more. One of 2016's biggest TV events, Stranger Things came out of nowhere and grabbed everyone's attention thanks to its gripping supernatural story and pitch-perfect retro stylings, and Kyle Lambert's stunning poster was a vital part of the whole package. Briefed to create a 1980s-style poster reminiscent of classic, hand-painted movie artwork, he created this using an iPad Pro and Procreate. You can read about his process here. Created by Ogilvy & Mather Istanbul (now Ogilvy), Ford's clever 'adaptive poster' was used to promote the company's new adaptive lighting technology. Using an optical illusion, the poster was designed to allow people to experience its Adaptive Front Lighting System that reacts to steering input when going round corners. As the viewer moves around the multi-layered poster, the perspective shifts and allows the viewer to 'see' round the corner. It was launched in authorised Ford dealers and certain locations around Europe – and you can see how it was done in the video above. Released in 2015, Iris is a documentary film celebrating the life of fashion icon Iris Apfel, and this poster by Gravillis Inc is one of the best we've seen. Iris herself appears in black and white, while a vibrant patterned background showcases her love of fashion. A clever and original concept that doesn't disappoint in the style stakes. Another film that didn't set the movie world alight was 2015's sci-fi offering Maze Runner: Scorch Trials. While the creators did release some more typical poster designs, the public was also treated to this more left-field design, which makes clever use of negative space. The lab flask shape is a nod to the movie's plot, while the bold use of red in the central strip intensifies the feeling of heat in the scene. Gig posters are an arena in which graphic designers can really indulge their passion for both art and music. So, it's always a delight to see music festivals and designers coming together to produce something incredibly special; that's exactly what Green Man festival and the UK Poster Association have done here. "The festival asked us to create a series of limited edition prints for some of the acts playing at the festival," explains designer Luke Drozd. "Eight acts were chosen in total, and they show the diversity of acts that are playing the festival as well as the diversity of talent exhibiting at the UKPA stall. Each poster was created as a limited edition A2 screen print." Everyone knows that making a character stare directly out of a movie poster is a sure-fire way to grab the attention of passers-by. Brilliantly illustrated by Akiko Stehrenberger, this poster for 2014 horror hit It Follows ramps up the intensity by framing the figure's eyes in the reflection of a car windscreen mirror. Stehrenberger has crafted posters for a huge range of indie and commercial releases, and it's easy to see why he's in such demand. Who couldn't stop and stare at this one? An unconventional poster design for an unconventional film, artist Vasilis Marmatakis has captured the characters embracing empty silhouettes of each other. Marmatakis has also crafted the titles for Dogtooth as well as working on a range of other movie posters. Donald Trump is president of the USA. When Trump was elected, Kurt McGhee calculated that a four-year term is 1,462 days, and he created this poster to ram that fact home and to give you some minimal therapy as you cross off every day that passes. "It may not seem that long until you see that amount of time in days," he says. "No matter who it is, a lot can go wrong in 1,462 days." Comic book lover and avid gamer Grégoire Guillemin often creates superhero inspired designs and these minimalist vintage posters have hit the right spot when it comes to inspirational graphic design. The likes of Batman, the Green Hornet and the Silver Surfer are all included in the retro re-imaginings. The gorgeous typography teamed with the brilliantly sketched superhero illustrations have had us falling head over heels for the series. We love it when illustration is given centre stage with movie posters and this one for 'Call Me Lucky' is an absolute delight to look at. Contrasting a minimal colour palette with an intricate execution, the design was conjured up by Vodka Creative, with Jesse Vital taking care of the artwork itself.